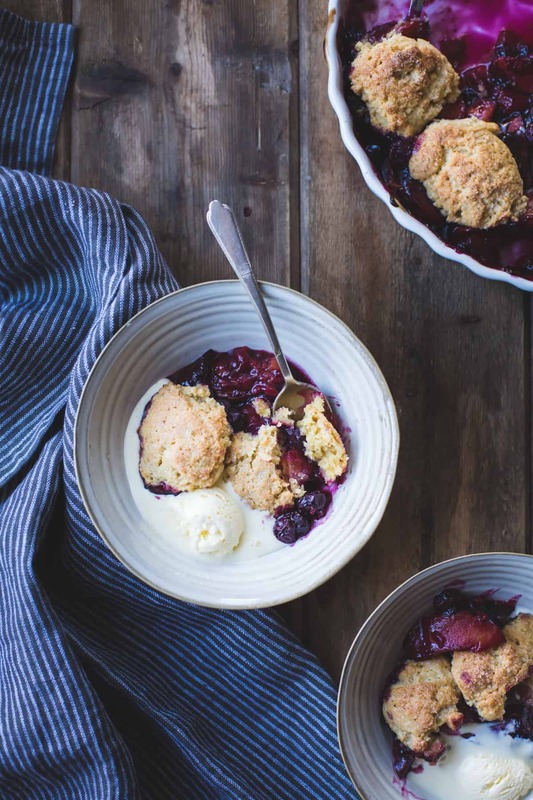 Blueberries and plums canoodle beneath tender gluten-free biscuits laced with the sunny taste of corn flour in this late-summer cobbler. I’m excited to share a little project that Sarah and I have been working on: a video trailer for Alternative Baker! We found the perfect song to pair with footage of me making some of my favorite treats from the book (spoiler: this cobbler is one of them!) by The Good Lovelies, whose lush harmonies make us want to get in the kitchen and cook. A huge thanks to The Good Lovelies for kindly sharing their song Kiss Me in the Kitchen, to Page Street Publishing Co. for making this video possible, and most of all to Sarah for being a rockstar videographer and friend! 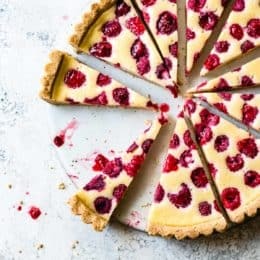 Sarah’s sharing a gorgeous tart recipe adapted from the book today as well – YUM. 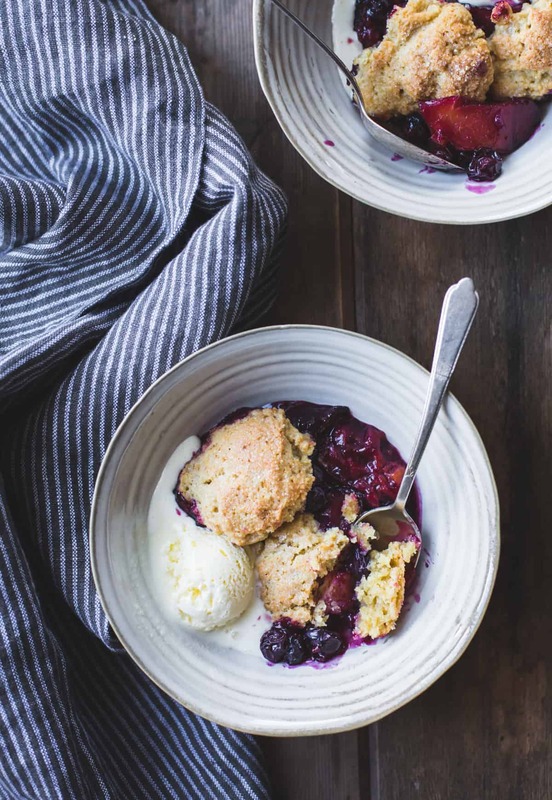 This cobbler recipe holds an extra special place in my heart not only because it is a delicious, sweet-tart, late-summer treat, but also because it represented a sort of turning point in the book making process. Pre-book, cobbler was one of my biggest nemeses in baking, both with and without alternative flours, and I would take a crisp over a cobbler any day. But I was hell-bent on having a cobbler join the crisps and pandowdies in my Rustic Fruit Desserts chapter, so I cranked out cobbler after cobbler hoping to hit upon the magic formula of light, craggy biscuit that stayed crisp on top and moist in the middle. One cobbler resembled tight brown meatballs atop a sea of peaches. Another had tough, dry biscuits that were pasty and undercooked in the middle. A recipe I found online baked up looking like turd-topped fruit. My manuscript was due in a few short weeks, which I needed to spend tying up loose ends, not making (literally) crappy cobbler! I was close to giving up when a recipe tester came to the rescue. A longtime blog reader, Caterina had sent me a five paragraph-long email after I’d put out a call for recipe testers, fleshing out a three-pronged argument on why I should pick her. I thought, “This chick’s going to be SUPER annoying,” but I wasn’t about to turn down a pair of helping hands. Instead, Caterina was my savior. She hunkered down in the trenches with me during crunch time, testing recipes, giving detailed feedback, supporting my worries with kind words at all times of day. This total stranger gave hours, days, weeks of her time helping me out for no reason other than being a kind (Canadian) soul. When I came crying to Caterina for cobbler help, she sent back what seemed like an odd recipe. Inspired by a formula from Gourmet that boasted nearly 500 positive reviews, she heated the liquid before adding it to the biscuits. Instead of the hot water called for in the original recipe, she chose equal parts yogurt and cream. She swore up and down that she’d hit upon cobbler perfection. But I was a dork. I was short on time and skeptical of her crazy, hot biscuit ways. The cardinal rule of biscuit-making is that you must keep the butter cold cold cold at all costs. Heating the liquid seemed insane. I told Caterina as much, but she kept insisting. So I tried making the biscuits with hot milk, and she was right: they baked up craggy and light. Still not perfect, though. Caterina urged again, “Try the yogurt and cream mixture, its perfect!! !” So I finally did. Like me, Caterina obsesses over dessert while exercising. “Today at the gym I was creating a blueberry cobbler recipe in my head with creme fraiche scones,” she wrote. So I threw blueberries together with some plums I had lying around. I needed to use corn flour in another recipe, so I added it into the biscuits since I like it with both plums and berries. I stirred up Caterina’s biscuit formula, hot dairy and all, put it in the oven, and crossed my fingers and toes. This cobbler was so good, I practically cried. The fruit was barely sweet, almost bracing – a huge relief as my tastebuds were so saturated with sweetness at this point, I could hardly stomach dessert anymore. Craggy, golden biscuits sang with the warm, grassy flavor of corn flour. The hot, acidic dairy went to work on the baking powder in the biscuit dough, giving it an instant lift that left them airy and light. The cream gave them meltingly tender middles and a rich complexity. I made this cobbler just before heading out of town to tag along with Jay to Ashland, Oregon where he was performing and I would spend the entire time holed up in our hotel typing away. 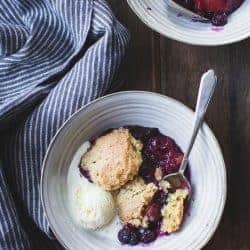 I ate this cobbler cold, topped with plain yogurt, the thick indigo compote juicy against nubby biscuits and tart yogurt. At that moment in time, it was my favorite dessert in the entire book. More so than Chocolate Bergamot Truffle Tart with Olive Oil and Flaky Salt. More so than Stone Fruit and Marzipan Crumble. More so even than Chocolate Zucchini Cake with Matcha Cream Cheese Frosting. 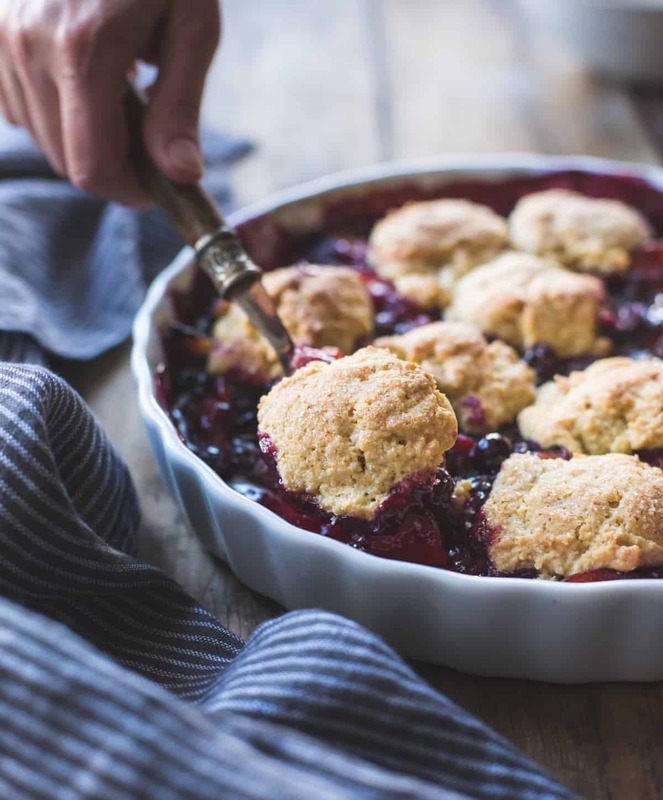 I was so thrilled with this cobbler formula that I added two more cobblers to the book – one version with strawberries, rhubarb, and ginger amaranth biscuits, and an early fall version with peaches, cinnamon, teff flour, and whiskey. Now instead of filling me with loathsome venom as it once did, cobbler fills my heart (and my mouth) with warmth and love. It reminds me of the camaraderie I found in the unlikeliest of places during an otherwise lonely project, and of all the helpful hands that went into making Alternative Baker. 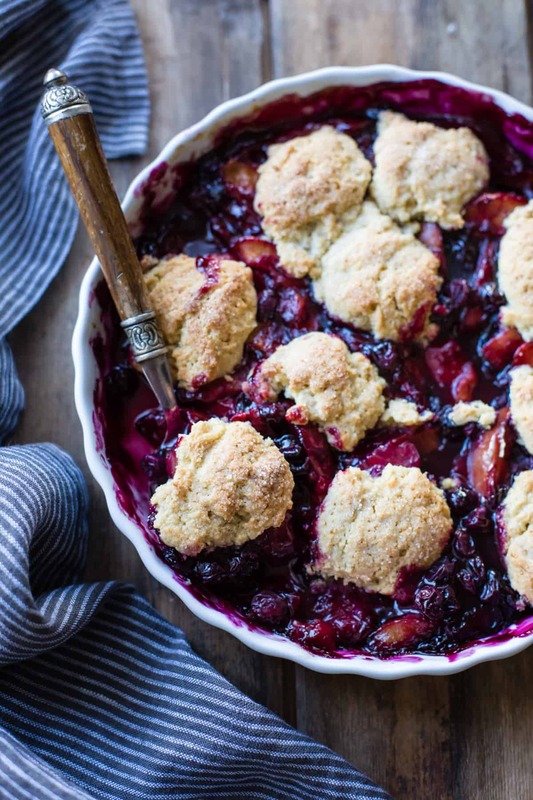 This cobbler has a high fruit-to-biscuit ratio, which Caterina and I both love. You can trade the plums for ripe peaches or nectarines and the blueberries for raspberries, blackberries, or huckleberries. If you want to get your hands on a copy of Alternative Baker, it can be preordered anywhere books are sold (links to the usual places and more info here). This recipe comes directly from my cookbook Alternative Baker: Reinventing Dessert with Gluten-Free Grains and Flours. 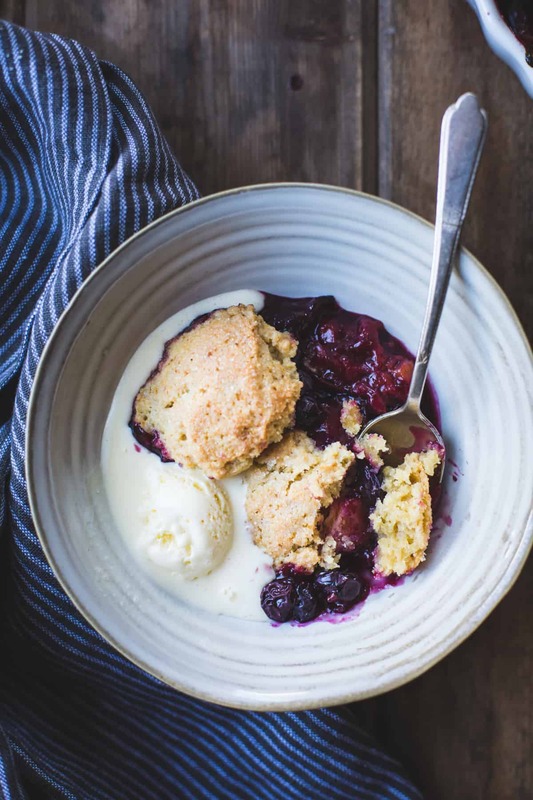 This cobbler carries the sunny flavor of corn flour in light, buttery biscuits perched atop indigo blueberry-plum compote. Adding hot yogurt and cream to the biscuit dough may seem like an odd instruction, but it’s the key to fluffy biscuits that bake up light, craggy and full of flavor. The biscuits taste like very moist, tender cornbread, the perfect foil for tart-sweet summer fruit. I especially like this cobbler at room temperature with a scoop of yogurt or whipped cream. Feel free to trade the plums for peaches, or the blueberries for black- or raspberries; all are lovely with stone fruit and corn. Be sure to use fine, pale yellow corn flour in the biscuits rather than cornmeal or cornstarch. Position a rack in the center of the oven and preheat to 425ºF (220ºC). To make the filling, halve the plums (or if they cling to the pit, cut them off of the pit) and cut them into 1⁄2-inch (1.3-cm) wedges. Rinse the blueberries and drain well. 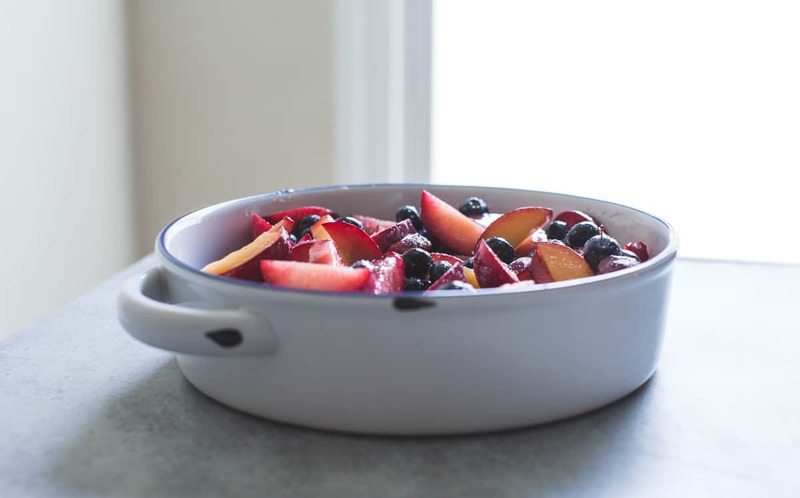 Combine the sliced plums, blueberries, sugar, cornstarch and salt in a large bowl, and toss to combine. 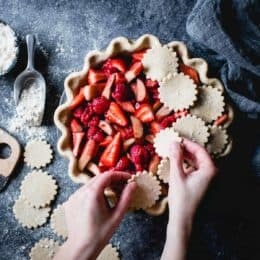 Scrape the fruit and any juices into a 9-inch (23-cm) square or 10-inch (25-cm) round baking dish or the equivalent, and place the dish on a rimmed baking sheet to catch any drips. Place in the oven and bake for 20 minutes, until the juices bubble thickly. While the filling bakes, make the biscuits. In a large bowl, combine the sweet rice, corn and oat flours with the 2 tablespoons (25 g) sugar, baking powder and salt. Add the butter, and rub with your fingertips or cut in with a pastry blender until the butter is somewhat worked in with lots of little pea-sized butter bits. Chill this mixture until needed, about 10 minutes. When the fruit is nearly done, combine the yogurt and 3 tablespoons (45 ml) cream in a small saucepan. 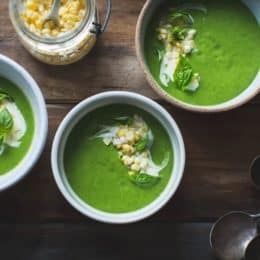 Place over a medium flame and heat, stirring frequently, until the mixture is hot and steamy, 1–2 minutes (don’t let it boil or it might separate). Quickly but gently stir the hot dairy into the butter/flour mixture, stirring just until combined, evenly moistened and no floury bits remain; do not overstir. Remove the fruit from the oven, give it a gentle stir to redistribute, then use a tablespoon to drop the batter onto the fruit, creating 10–12 rough mounds. Immediately dab and brush the tops with the remaining 1 tablespoon (15 ml) cream and sprinkle with the remaining 2 teaspoons (8 g) sugar. Bake the cobbler until the biscuits are golden on top and the fruit is bubbling thickly, 18–25 more minutes. Let the cobbler cool for at least 10 minutes to allow the fruit to thicken up and the biscuits to finish baking from residual heat. Scoop into bowls and serve warm, topped with scoops of vanilla ice cream, or at room temperature with whipped cream. The cobbler is best within a few hours of baking, but leftovers can be refrigerated airtight for up to 2 days. Reheat before serving. What a beautiful book launch video. I’ve been so excited for this book since I tested a few recipes for you sometime last year and I can’t wait to get my hands on a copy. Congratulations on a job well done! Thank you so much for the testing help and kind words, Deanne! I can’t wait for you to see it. Really loving those cornflour biscuits! This looks awesome! LOVE LOVE LOVE!!! the book trailer … crazy Fun and insanely Delish looking! I love the trailer!! I also prefer crisps but you have me wondering with this cobbler. :) Congratulations! Love the trailer, it looks so fun and delicious. Love the music too. This trailer is so adorable as are you! I’m thrilled to get my copy of your book soon. The trailer made my mouth water. Yum! That is just the sweetest story! (And I would’ve been skeptical too about the heating of the biscuit liquids. But it sounds like it worked, which is awesome!) So many congrats on the book, lady! Looks like it’s going to be a hit!! Everything about this is super lovely…the trailer, the cobbler, all the beautiful photos and videos. Everything. Congrats! Aw, thank you SO MUCH Brenda! How on earth do you know the word “Canoodle” lol! I haven’t used that word in forever :) Great cobbler btw! One. I love that you said canoodle. SUCH A GOOD WORD. And this cobbler? I want to eat it…for breakfast. So beautiful! Can’t wait to get my hands on your book. #TrailerGoals. Also, I love that you used canoodle in a recipe description. And, I want to eat this. Finally, you’re awesome and I can’t wait for the book. Haha, thanks Jen. :) You’re awesome and I can’t wait for YOUR book! This video is the BEST! Love it and I can’t wait to see the book! This video, with the music, your pretty face and the excellent videos brought tears of joy to my eyes. I’m proud of you and touched by your accomplishments. I’m looking forward to receiving the book! By the way, who did the music? It’s perfect for the video. That looks so yum! you can’t get GF oats here in NZ, am wondering what you would suggest as a GF alternative? Many thanks! Oh that’s too bad! I would probably try either sorghum flour or a GF AP blend in place of the oat flour. Oat flour is a bit unique for its soft, starchy texture and protein content, so the biscuits may be less pillowy without it. Let me know how it goes! I have my hands on your recipes and now want to make this as well, ASAP :) What would be the best way to substitute white rice flour? How a bout barley flour, what do you think? Thank you! You have now idea how happy this makes me!! And I swear I must not have been paying close enough attention because I didn’t even realize you heated the cream and butter! Hello, I love your work with various flours, please keep going! Forgive me for my ignorance but, can these cobbler biscuits be eaten as savoury Southern biscuits? And what can the sweet rice flour be replaced with? I can’t get it certified gluten-free in my country for now. Also, a substitute for oat flour? Sorry again. You could try a GF AP blend in its place, or maybe sorghum flour, though the texture will likely be different. Substitute by weight if you can!